Paul Revere had a large family with a total of 51 grandchildren. 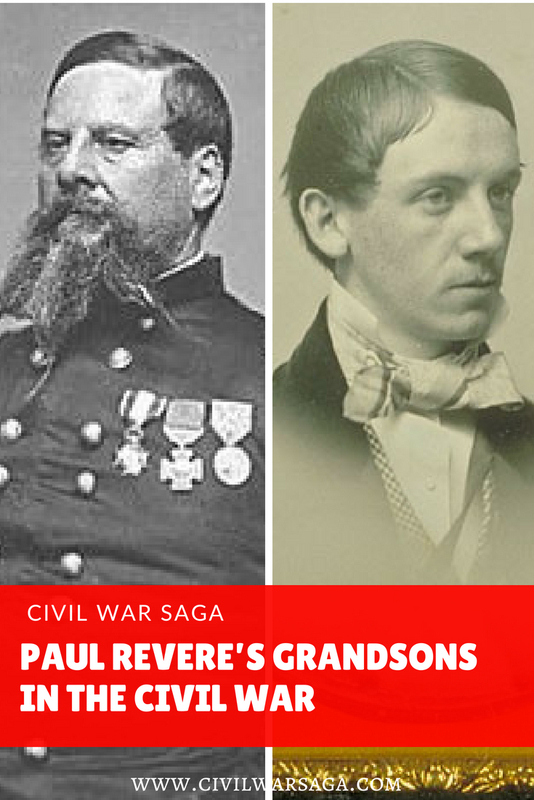 Three of Revere’s grandchildren, Paul Joseph Revere, Joseph Warren Revere and Edward Hutchinson Revere, served in the Union army during the Civil War. Paul Joseph Revere served as a colonel in the 20th Massachusetts Regiment along with Edward Hutchinson Revere who was an assistant army surgeon. Joseph Warren Revere served as a Brigadier General in the New Jersey Volunteer Infantry. Both Paul and Edward were captured by Confederate troops during the Battle at Ball’s Bluff in Virginia in October of 1861. Edward was first taken to a Confederate prison in Leesburg and then to a prison at the Harwood tobacco factory in Richmond. On February 22, Edward and Paul were paroled (released in exchange for Confederate prisoners) and went home to await their official exchange, which occurred in May. 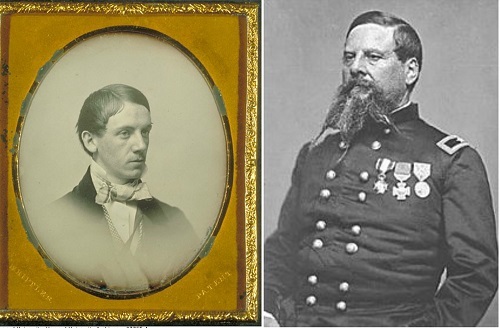 Just a few months later, Paul and Edward fought in the Battle of Antietam in September of 1862. It was during this battle that Paul was wounded again and Edward was shot and killed while caring for a wounded soldier. Fortunately for Paul, he made another full recovery and went back to war. Paul’s luck ran out in July of 1863 when he led his troops in the famous Battle of Gettysburg in Pennsylvania and was wounded on the second day of the battle. He passed away just two days later. Paul was later posthumously promoted to Brigadier General. Joseph was the only one of Paul Revere’s grandsons to survive the Civil War, but he had his fair share of bad fortune as well. At the Battle of Chancellorsville in the spring of 1863, Joseph withdrew his troops from battle without orders to do so, resulting in a court martial. Sentenced to be dismissed from the army, President Abraham Lincoln allowed Joseph to resign instead. Coincidentally, Lincoln was related to the Revere family through marriage, though it is not clear if Lincoln knew about this family connection during his lifetime. In the late 1870s, Union spy Elizabeth Van Lew, who spent her family fortune helping Union soldiers during the war, lost her job as a postmaster and wrote to the Revere family in Massachusetts desperate for help. Grateful for the aid she gave to Paul Joseph Revere while in Richmond, the Revere family set up a bank account for Van Lew with contributions from the families of Union prisoners she assisted in Richmond. Van Lew lived off these contributions for the remainder of her life. For more info on former Civil War soldiers, check out the following article on Famous Civil War Soldiers. I am writing a small booklet that includes some information about Sgt. Paul Revere and his travels by train in 1861. I’m pretty sure it is in the Public Domain, but may I have your permission to use Paul Joseph Revere’s portrait that appears on your site? Hi Brenda, as far as I know that photo is in the public domain so you can use it however you like. I remember reading that joshua chamberlain was related to Paul Revere. Is this a fact? Besides learning of the military service of Paul Revere’s grandsons, it’s very interesting to learn of the connection between the Reveres and Elizabeth Van Lew. Thanks for sharing this bit of perhaps otherwise forgotten history!